In this post we will be trying to explore different options for developing Google applications. Google’s term for applications running on the Glass are Glasswares. If you are a C# developer, Xamarin has already made Android and iOS development for you by introducing their MonoTouch and Mono for Android platforms. Here we are using free tier for Xamarin subscriptions. Please remember that for any serious development using Xamarin tools, you would need to upgrade to a paid subscription. The details of available plans can be found here [Xamarin plans]. 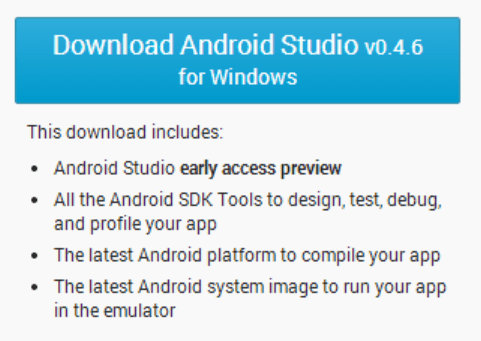 Let’s first download Xamarin tools. Alongside all the required tools, it should also install its dependencies. Please remember that for starter plan, you have a trial period for Visual Studio extension for Xamarin. 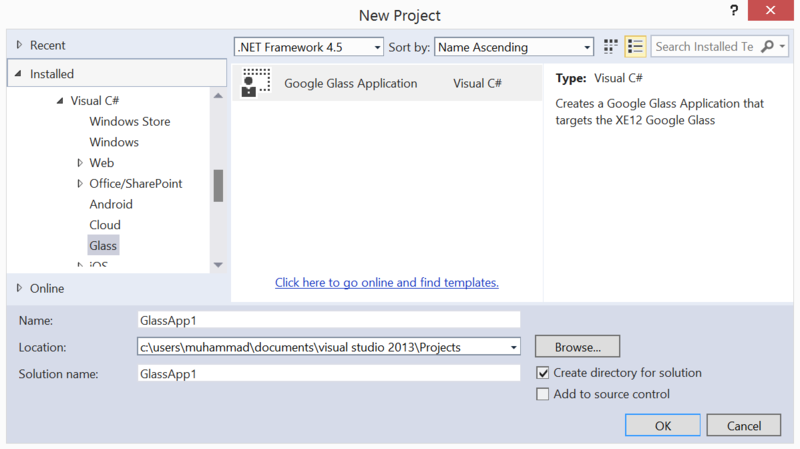 There is also a Visual Studio 2012 / 2013 extension available for developing Glasswares in C#. You need to install Xamarin tools before doing any development using this extension. The extension is developed by Chris Hardy. You can find him on Twitter [@Chrisntr]. If you don’t have Visual Studio extension for Xamarin [Starter plan] then you can always use Xamarin Studio. The similar add-in is also available here. You can install the add-ins from Tools -> Add-in Manager. And now you should have the template to develop Glassware in Xamarin Studio. 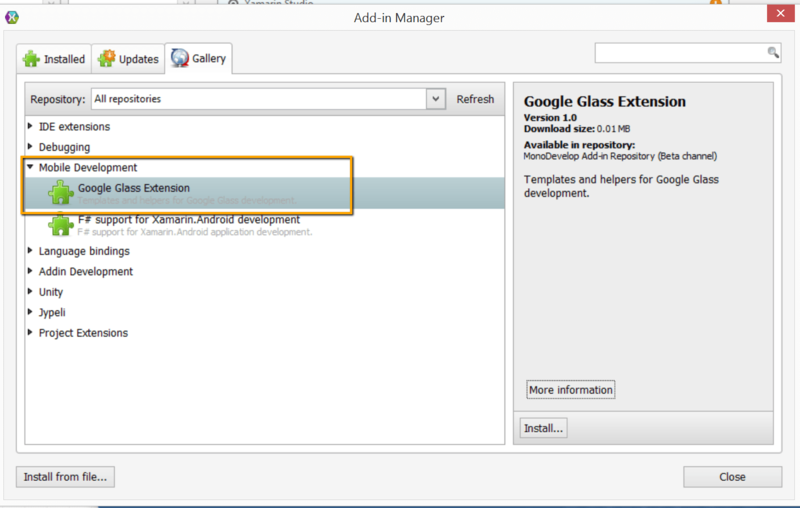 Since glasswares are android apps, we can use all the tools used for developing android apps. The easiest option is to download ADT bundle. This bundle has all the necessary requirements for developing android apps. This includes Eclipse with ADT plugin, SDK and platform tools, android platform & tools and latest system image for emulator. Initially, there was only one option to develop Glassware, which was Mirror API. The GDK option was announced in November last year (2013). It is still a sneak peek version of the API, so they might change it upside down without even apologizing :). The Glasswares built with GDK run locally on Glass, so it seems that it can have the offline experience for your applications which is currently missing in the ones developed using Mirror API. The GDK is the Android SDK plus a number of add-ons including voice, gestures detectors and cards. It was not released with a Glass Emulator so that should add to the time testing your app during development. Unlike Microsoft where GDK is for Game Development Kit, here it means Glass Development Kit. The GDK is provided as a component in Xamarin Studio.